Benelli Raffaello Crio shotgun review. Fashion is an odd thing and logic often has little or no part in it. Take, for example, the 28-bore, which not many years ago was very much the province of the knowledgeable enthusiast. For most shooters this gauge of gun was an unknown factor, quite rare and supplies of ammunition were somewhat limited. It seemed to sit in a sort of limbo world and the popularity of its great rival, the .410, eclipsed the 28-bore to the extent that it seemed on the verge of oblivion. Yet the 28-bore was always the better gun, even when most readily available cartridges contained 16g of shot compared with a .410 magnum load of around 18g. 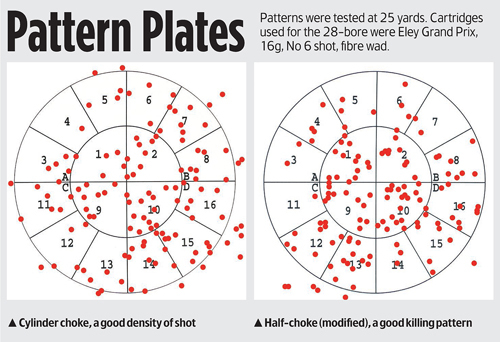 The 28-bore, its supporters claimed with some justification, threw better patterns, hit hard and had the edge on handling. For the ultra-small-gauge enthusiast this really was the gun par excellence. Today it would seem a lot more shooters agree, as the 28-bore has been rediscovered or become fashionable, one might say. New 28s stand racked on dealers? shelves next to 12s and 20s, and if you look hard you might be lucky enough to find a Benelli 28-bore self-loader. The first impression on viewing the gun in its case is that it seems quite large for a 28-bore. Of course it is not really large at all, but the long black alloy receiver has this visual effect. Once assembled, there is the contrasting feel of lightness and the slim barrel makes it appear like a black wand. For a shotgun of this type it actually qualifies as quite dinky. Handling is delightful; it is effortless to mount to the shoulder, fast to pick up a point of aim, yet steady once on target. It seemed to have all the makings of a fun little gun and I found myself looking forward to field testing it. Before going any further I had to adjust the stock, which is achieved with a variety of spacers for both drop and cast. On arrival it was fitted with a parallel spacer, giving only 2in drop at the heel. There was one spare spacer to increase the drop, but two to reduce it, which seemed odd. This can be fiddly, as Benelli fits a bar with a nut-and-spring washer on the end, meaning long-nosed pliers are useful for reassembly. Apart from that, the excellent diagrams in the instruction book tell you everything you need to know. At 5lb it is certainly lightweight, and this is achieved not only with slim lines, but with clever use of materials. As well as the alloy-bodied receiver, there is a high-tech carbon-fibre top rib with one of the tiniest centre beads I have ever seen. Some further subtle weight-saving is achieved in the choice of walnut. Inside it can be seen to be sound and strong in the grain but it is not especially dense. The glorious colour and dark veining on the outside is courtesy of Benelli?s ?Elegance? system; in other words, it is applied as part of the finish. Amazingly, it is very effective with a pleasing satin glow. The barrel is not as long as it first appears at a shade under 26in. On the outside it is glossy black, matching the finish of the steel receiver cover, and in the bore it shows a fine chrome finish. At the breech, directly behind the chamber, are the lugs where the bolt head locks into place when closed. This Raffaello is fitted with Benelli?s Crio chokes, which are a form of elongated choke tube but fitted completely inside the barrel. This choke system has a leaflet all of its own explaining the benefits of cryogenic treatment of steel, or cooling to below -100°C, and the gentle form of the choke shape. Interestingly, the latter point is something the old gun makers, with their lapping tools and polishing bars, knew all about. Perhaps this is another area where we are going to come full circle and use the skills learned from those past masters. At the moment, the only chokes supplied as standard are half-choke and cylinder. The latter seems an unusual choice for a small-gauge gun, as in many forms of shooting some choke is an advantage to get a good density of shot in the pattern. However, I would have to see how it tested in the field. The action is well constructed and mechanically neat and simple. Individual parts are nicely finished and while the inertia system can be sensitive to cartridge loadings, with this gun it proved forgiving. 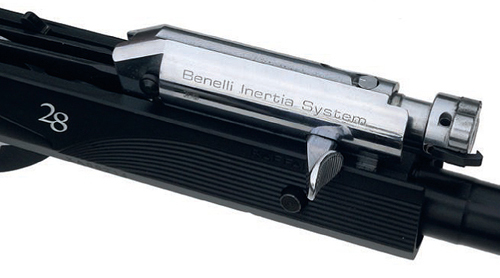 Benelli?s inertia operation is gradually becoming better known; it is a well-engineered and very strong system that is designed without resorting to a massively heavy construction. It has a fairly long travel, but gets away from the need for gas ports, pistons and the associated linkage that generally requires more maintenance. Also, though recoil induced, it is more sophisticated than the old long recoil system. Testing turned out to be the enjoyable experience anticipated. With the angled stock spacer fitted it was now more in line with my eye, giving a drop of 2.3/8in at the heel and 1.5in at the tip of the comb, and all set up with cast off for a right-hander. Deliberate shots at the pattern plate highlighted the fact that the trigger-pull was a little long but not at all out of the ordinary for a self-loader. A consistent weight of pull of 4.3/4lb was certainly quite acceptable and not likely to pull one off aim. Testing took place mainly with 16g loads, but with a smattering of 24g cartridges for a more comprehensive test. Cartridge cases were plastic but again with a few old paper cases thrown in as a check on functioning. I can report that in use this gun is really nice and with 16g loads it gives a good impression of being almost recoilless. It could be the perfect antidote for anyone with a gun-shy flinch. With the lighter loads all one really notices is the modest discharge (especially modest when wearing ear defenders) and the click-clack of the mechanism cycling. The 24g loads are snappier and, though felt recoil can be difficult to judge, it seemed little different to using a 20-bore side-by-side. Empty cases flew well forward and clear, and the old paper case cartridges did not cause a problem. At 25 yards with 16g loads, performance was very good, giving a reasonable density of shot within the pattern. The same applied using larger loads, which gave good killing patterns out to 35 yards. This is quite an exceptional lightweight self-loader that certainly punches above its weight. It would make a very good training gun on a clay ground or an unobtrusive companion for walking-up the hedgerows. I think with the bigger loads and careful choice of choke, it could even be handy when crouched in the pigeon decoy hide. A well-made and technically interesting gun incorporating some unique features. The Raffaello impressed with its delightful, fast and positive handling. This gun has a good finish that is very much in the modern style. I found that a better variety of stock spacers might be an advantage. Value for money is not bad, but it will be better when the pound strengthens against the euro. An interesting, reliable and nice-handling lightweight shotgun, which is well made, quite well styled and incorporates several novel features.